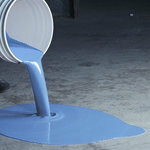 This is the coating to use when there is little or no down time to coat floors. Perfect for areas that cannot be heated to ambient temperatures. A pleasing gloss finish gives top protection against impact and fallen objects. Can be reapplied in a few hours between coats or at any time in the future. Fast Cure™ is approved for shipping to all 50 states by ground or air.